The farmhouse is often let together with the Chai and both can cater for a maximum of 14 plus up to 3 babies and the price varies according to the number of people in the group. Please note the rates vary depending on the season, and if you are renting one or both houses. NEW! BETTER WI FI NOW INSTALLED IN EACH HOUSE! WOOD BURNERS AND CENTRAL HEATING IN EACH HOUSE FOR COSY WINTER BREAKS! Three charming and characterful properties situated in beautiful countryside with capacity for up to 18 people plus up to 2 babies. Situated in the Aquitaine near the Dordogne border, convenient for all the attractions of both the Dordogne and Lot et Garonne. These luxuriously equipped self-catering holiday properties, renovated to the highest standards and retaining original oak beams, stone walls and tiled floors, are beautifully furnished. Gardens provide space and privacy. The farmhouse has four bedrooms, one en suite on the ground floor, and three double bedrooms on the first floor, along with a bathroom with bath and shower and WC. There is a games space on the first floor where there is also a sofa bed. On the ground floor there is a large lounge, with sofas and a dining table. There is a fully equipped kitchen with a breakfast table. A utility room off the kitchen contains the washing machine. The Chai has three bedrooms , all on the ground floor; one with an en suite. In addition there is a sofa bed; cots for babies can be provided. A large lounge gives access to a shaded terrace, equipped with dining table and BBQ. There is a fully equipped kitchen with an adjacent dining room. The Pigeonnier. This romantic house has one bedroom on the first floor; a kitchen/diner on the ground floor; a large lounge opening on to a south facing terrace overlooking the private pool. The Farmhouse and Chai share the 12 x 6 metre swimming pool with Roman steps with it's own large pool house and covered terrace, which enjoys stunning views and sun throughout the day. Both UK and French satellite TV channels are available, as well as a DVD players in all three houses. A range of games are available including table tennis, a trampoline, badminton, swing ball, boules. PLEASE NOTE THERE ARE SEPARATE TARRIFS DEPENDING ON SEASON. RATES ARE BASED ON NUMBER OF CLIENTS; FARMHOUSE EIGHT PEOPLE; CHAI SIX, AND PIGEONNIER FOUR. ADDITIONAL CHARGES MAY APPLY FOR ADDITIONAL GUESTS. A 10% DISCOUNT IS OFFERED ON BOOKINGS OF BOTH FARMHOUSE AND CHAI TOGETHER. WE DO LET THE PROPERTIES SEPARATELY. Superbly situated for touring both the Dordogne and the Bastide towns of the beautiful Lot et Garonne countryside, the property is only a half hour drive from several excellent 18 hole golf courses. There are a wealth of leisure activities in the area including horse riding, canoeing and kayaking, vineyard visits, traditional local markets, karting, water-parks and swimming lakes. We are situated in the middle of the old Aquitaine and every village and town has something of historical interest . There are many Chateaux and castles within easy travelling distance from us and the countryside is amongst the finest in France.There are many lovely walks , great lanes for cycling, horse riding and golf courses of championship standard within a half hour drive . You may enjoy the bustle of the local markets, all taking place in villages and towns dating back to the 12th century, and there are, of course, a wealth of local restaurants where you can enjoy some superb food. Most of the local villages hold "night markets" where you can dine on local food and wine. There are also good value "tables d'hotes" where again you can dine on local good value produce. Wine estates are nearby, and we can arrange a wine tasting tour to local vinyards or to saint Emilion, one of the great Bordeaux wines. BERGERAC INTERNATIONAL AIRPORT IS 30 MINUTES AWAY WITH LOW COST FLIGHTS FROM UK AND EUROPE. BORDEAUX AIRPORT IS 1 HOUR 30 MINUTES AWAY; TOULOUSE 2 HOURS. Gary and Mick bought the property in February 2015, from the previous owners who renovated the properties from 2000 over the next few years. We live in the main house, a converted barn, so are available for help and information if you need, but will completely respect your privacy and enjoyment of your holiday. We have been carrying out a series of improvements to the properties, including new pool liners to the large pool and the Pigeonnier pool; Roman steps to the Pigeonnier pool, new flat screen televisions with British and French satellite channels. Each house now has wi fi access. We have provided more kitchen equipment and other upgrades to improve your experience. Fon Du Bourg offers luxury standard self catering accommodation to meet the needs of large families and groups of friends. We provide all bedroom linen, towels and pool towels. All of hotel standard. The kitchen is fully equipped with range hob and oven, fridge freezer, dish washer and washing machine in the utility room. A welcome pack is provided to all clients. If you wish to specify what groceries and food you would like if you are arriving late, just let us know. The choice is yours; a peaceful vacation around the pool and /or exploring the rich culture, history and gastronomy of this unique part of France. Whatever your choice, you will have luxury accommodation meeting all your needs, located in a peaceful, rural setting but with easy access to tourist amenities. Unbelievably peaceful and in the midst of really gorgeous countryside but very near to lots of great places and activities. Apart from food and wine, you will find nearby tennis, horseriding, go-karting, lakes for swimming and fishing, great walks and cycle routes, as well as the artistic bastide towns with their rich history. The farmhouse has a separate downstairs cloakroom with toilet and handbasin. The ground floor double bedroom has it's own en suite shower room with walk in shower, wc and handbasin. Upstairs the family bathroom has toilet, washbasin and bath with overhead shower. There is constant hot water 24 h /24h. Located in utility room; exclusive use. The Farmhouse has its own superbly equipped kitchen with 6 ring range stove, dishwasher, microwave, washing machine and large fridge freezer, there is a a very large living room with comfortable seating, widescreen TV with CD/DVD player. The Terrace has seating and table for 8 with a large inclinable awning. We were lucky enough to stay at Gary and Mick's for a long weekend in January while we were doing some wedding planning in the area. My fiancée and I stayed with our baby and we had such a nice time. The pigeonnier was lovely and warm with central heating PLUS a wood-burning fire (all wood was supplied for us). We arrived to a basket of welcome supplies plus a bottle of wine - really thoughtful and helpful since we arrived in the evening when almost everything was shut. We liked our stay so much that we've rented the houses for 2 weeks in the summer during our wedding. Highly recommended for other families looking for a comfortable, beautiful place to spend some time together. Fon Du Bourg is set in the heart of rural Bergerac with sweeping generous lawns and landscaped vistas. The venue is stunning, nestled to the south of Bergerac, one can enjoy peace and quiet with brilliant views from the top pool (Fon du Bourg has 3 by the way). I stayed in the Farmhouse which was well appointed with a comfortable bed, spacious rooms, multiple BBQ's which were ideal for the blistering hot weather we experienced and sky television - perfect for watching the Euro's football on! Gary and Mick our host's were extremely welcoming and friendly throughout our stay and they have a wonderful dog called Alfie and kitten called Socks who are simply delightful to be around! I certainly can't complain about the price either which was very competitive. Overall, I would be very happy to stay there again and would highly recommend to anybody. A spacious farmhouse in the middle of nowhere with beautiful views over the countryside. Fab pool and plenty of varied areas for eating outside in the evening. Nearby you've got the gorgeous Castillonnes and Eymet with their wonderful markets and a real bonus for families is the lake 9k away at Lougratte. Mick and Gary are unobtrusive yet endlessly helpful hosts. Highly recommended! All you want from a French holiday in the sun. Attracted by the advertising photo and we were not dissapointed. 6 adults,2 children(7 and 9) + one 20 month old and 2 friends from Brittany,looking for the sun, walked in and began a lovely holiday from the start. The farmhouse and Chai were both roomy and light and gave us all the amenities we wanted. Our host , Gary, was welcoming and helpful throughout the 2 weeks and his visiting granddaughters were a delight. Golfing at Villaneuve, canoeing on the Garronde, fishing for carp in a local lake and local markets of course all our interests were catered for. The large pool deserves an individual mention providing a private and continuous source of fun and relaxation. Regarding local visits our favorite 'bastide' of Monpazier (we could sit in the square all day) and Chateax Biron, the massive proportions were breathtaking. altogether a wonderful 2 weeks, absolutely recommended. We loved our stay, the farmhouse and Chai were both amazing and very well equipped. The pool was heaven and we made good use of it every day! The owners Gary and Mick were so accommodating, they even moved a single bed into the other bedroom so that all the boys in our party could sleep in the same room, nothing was too much trouble. I would highly recommend staying here and we hope to return in the future. Thanks very much for your generous comments. Our family had a great time with yours, on the trampoline etc. We very much hope to accommodate you again, and if you are in the area do not hesitate to pop in for refreshments! We rented the farmhouse and chai for two weeks. Our friends stayed with their family (2 adults, children of 6, 4 and twins of 1 year old) in the farmhouse. We stayed with our family (2 adults, twins of 6 and one of 2 years old) in the chai. It is nice to spent a holiday apart but also together. The properties are very spacious, well equiped and have many extra's for children (children chairs, gate on the stairs, plastic plates, ...). Nice and very spacious pool with also a nice water depth for the children. The different terraces give you the opportunity to enjoy the morning or evening sun or choose for the shadow at noon. Keven is the perfect host. He is available when you need him, but he stays at the background not disturbing your privacy. Our friends had a problem with the heating of the warm water. Keven called the plumbers the same day and the next day everything was repaired. Nice to know is that the supermarket in Castillonnes is open on Saturday until 18h and is also open on Sunday morning. Despite the changeable weather this summer in France, we had a fantastic holiday at Fon du Bourg. We can recommend this place! 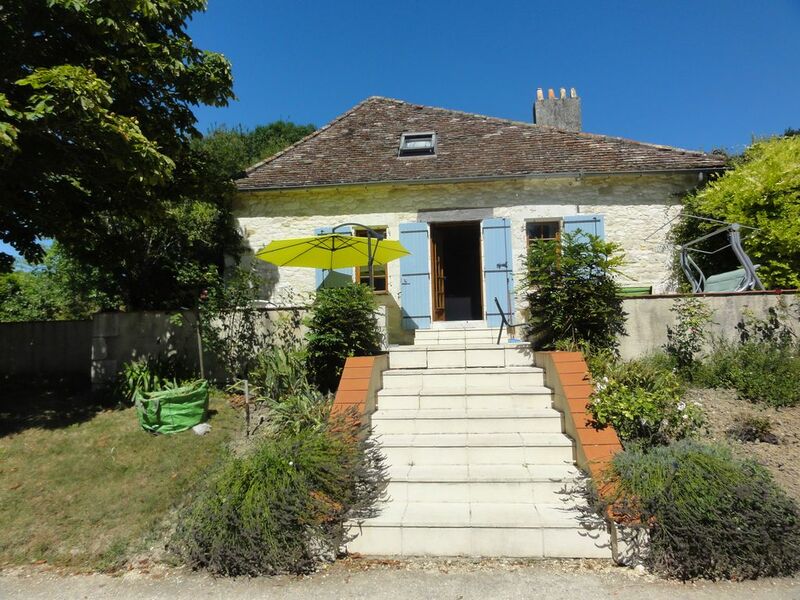 Romantic and rural the Farmhouse (4bed),Chai (3bed) and Pigeonnier (1bed) at 'Fon du Bourg' are situated on the edge of the small hamlet of Douzains, which is 6 kms from the nearest market town of Castillonnes, and 27 kms from Bergerac and its airport. (Daily flights from Paris, Amsterdam, Southampton, Stansted, Exeter, Liverpool, Leeds,Manchester and Edinburgh with Ryanair, jet2.com and Flybe). The property is surrounded by the beautiful open rolling countryside of the Aquitaine. The larger regional airports of Bordeaux and Toulouse are just one and a half hours drive. There is a wealth of places to see and things to do including visits to the Chateaux and romantic castles built during the 100 years war, canoeing on the Dordogne, the fabulous local traditional markets, hundreds of vineyards, wonderfully scenic medieval villages, a day trip to the gorgeous white sand beaches of the Atlantic coast, karting, bowling , Aqua parks , leisure lakes and activity centres at the Lac de Gurzon; or just walks, cycle rides or horse riding on any of the country lanes near us. Other Activities: Horse riding, cycling, aqua parks, karting, vineyards, leisure lakes. All prices are per week from Saturday to Saturday in Euros . Deposit and main payment non refundable in the event of cancellation.Guests should arrive after 4pm and should vacate the property by 10am on the day of departure. Failure to vacate on time will incur an extra fee as cleaning team will be delayed; 50 euros for each hour, part hour late vacating.Short breaks are available except in Peak season (June through September) We are also able to offer more 'tailored' holiday packages to ensure your perfect break with meals,excursions, extra cleaning etc etc. Discuss your requirements with us Rates are based on occupancy up to 8 persons; additional guests will incur an additional charge.